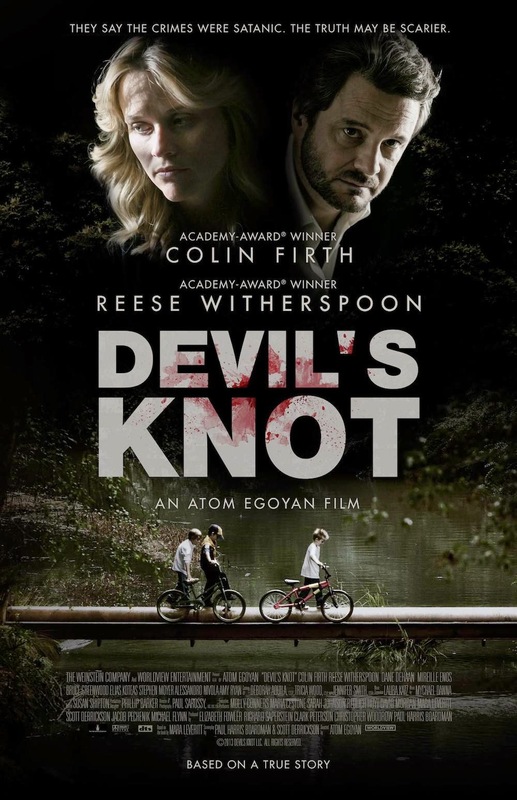 It's not easy to understand why, exactly, Devil's Knot exists. After four documentaries, including the morally duplicitous West of Memphis, detailing the events and hearsay surrounding a famous child murder trial, there could be very little, if anything, Atom Egoyan could add to public discourse of the affair. The biggest crime, however, is not that Egoyan has nothing new to offer but rather that, his film has absolutely nothing to say in any respect. Its not entirely certain what Egoyan is trying to achieve here. Why bother? The tale concerns the brutal murder of three children in Arkansas, their bodies' found hog-tied underwater. The town is shocked and repulsed by such senseless violence and, looking for individuals to blame, their collective fingers point towards a trio of local heavy metal fans - the deaths of the children are blamed on an alleged occult sacrifice and evidence is then sought to support this theory rather than vice versa. Private investigator Ron Lax (Colin Firth) is suspicious of proceedings and is a rare voice worried about a miscarriage of justice. A TV Movie of the Week (provided the week in question was a quiet one), every aspect of the film feels overly methodical and static - to refer to the feature as having a "run-time" would be misleading and suggestive of a brevity which does not exist; each second here drags incredibly. Lasting the two hours Devil's Knot commands often feels like a spiritually draining Sisyphean task - Egoyan may have created the world's dullest movie around satanic murders, moral panic and the loss of ethics in times of fear. This is the plodding movie's greatest achievement. The soundtrack creaks and cranks like obsolete machinery from a bygone era - the score hopes the presence of strings alone will nudge a Pavlovian response out of viewers. Alas, Egoyan's movie is so staid, inert and cold it's hard to feel moved in any manner. Conservative in many respects and utterly forgettable - to call Devil's Knot perfunctory would show a level of undue kindness.